The Leaning Pile of Books is a feature where I talk about books I got over the last week–old or new, bought or received for review consideration (usually unsolicited). Since I hope you will find new books you’re interested in reading in these posts, I try to be as informative as possible. If I can find them, links to excerpts, author’s websites, and places where you can find more information on the book are included. Both of this week’s books sound amazing, but first, here’s what happened last week in case you missed it! Julie Czerneda stopped by as part of the Futures Past Tour celebrating the upcoming release of the second Reunification book, The Gate to Futures Past. She shared the story of her recent move while in the midst of book deadlines, and there’s also a giveaway—I’m giving away two sets of the first two Reunification books! You can also enter the tour-wide Rafflecopter giveaway for all eight Clan Chronicles books. I’m actually going through preparing to move myself at the moment (the sorting of books is indeed HARD!) so I haven’t had much time for reading or writing reviews lately. However, there will be a guest post by Leanna Renee Hieber on Tuesday. 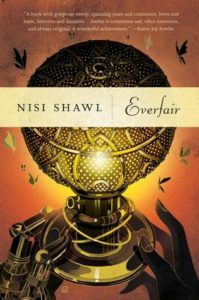 Everfair, award-winning author Nisi Shawl’s debut novel, will be released on September 6 (hardcover and ebook with the audiobook following in October). Tor.com has an excerpt from Everfair. There will be an Everfair tour throughout the month of September including events in Washington, Texas, Arizona, California, Wisconsin, Michigan, and Georgia. To see the dates, times, and locations, check out the News section on Nisi Shawl’s home page. Nisi Shawl’s collection Filter House was one of the 2009 recipients of the Tiptree Award, and her short fiction has also been nominated for the World Fantasy Award, the Theodore Sturgeon Award, the Gaylactic Spectrum Award, and the Carl Brandon Society Parallax Award. Her story “Cruel Sistah” was selected for the Year’s Best Fantasy & Horror in 2005. Everfair is a wonderful Neo-Victorian alternate history novel that explores the question of what might have come of Belgium’s disastrous colonization of the Congo if the native populations had learned about steam technology a bit earlier. Fabian Socialists from Great Britian join forces with African-American missionaries to purchase land from the Belgian Congo’s “owner,” King Leopold II. This land, named Everfair, is set aside as a safe haven, an imaginary Utopia for native populations of the Congo as well as escaped slaves returning from America and other places where African natives were being mistreated. Shawl’s speculative masterpiece manages to turn one of the worst human rights disasters on record into a marvelous and exciting exploration of the possibilities inherent in a turn of history. Everfair is told from a multiplicity of voices: Africans, Europeans, East Asians, and African Americans in complex relationships with one another, in a compelling range of voices that have historically been silenced. Everfair is not only a beautiful book but an educational and inspiring one that will give the reader new insight into an often ignored period of history. 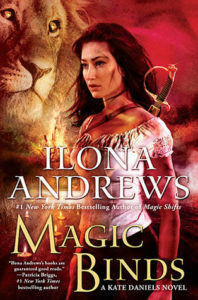 The latest novel in the Kate Daniels series by New York Times bestselling author(s) Ilona Andrews will be released on September 20 (hardcover, ebook, audiobook). Kate’s father, Roland, has kidnapped the demigod Saiman and is slowly bleeding him dry in his never-ending bid for power. A Witch Oracle has predicted that if Kate marries the man she loves, Atlanta will burn and she will lose him forever. And the only person Kate can ask for help is long dead.